Are you a motivated and passionate student, who would like to see and experience the world of Financial Risk Management consulting? Then this is the job for you! Are you ready to give your career a flying start? You will join our ‘Financial Institutions’ team, a team of 50 Financial Risk Management Consultants (99% have a quantitative background). This team focuses on financial risk related projects for banks, insurers and asset managers. This team is looking for a student who is available for at least 2 days a week. As an analyst, your role within the team is to be proactive and support our consultants with projects for clients and/or projects for Zanders. You have a keen understanding of the goal of the project and offer creative and innovative ideas on various topics. You are interested in financial models and passionate about bringing ideas to life. You are always looking for new ways to learn and like to be continuously challenged. We offer you the opportunity to work alongside our experienced consultants within our Financial Institutions department. You will be working from our head office in Bussum, receive an appropriate salary and full reimbursement of travel expenses. Our team consists of risk professionals with a strong analytical background in Econometrics, Quantitative Finance or Mathematics. We are an ambitious and enthusiastic team with a focus on fun, team spirit and personal development. We are an international specialized consultancy firm advising global organizations within treasury management, risk management and corporate finance. Our clients choose us because of our specialist and trend setting ideas surrounding financial solutions. Our 160 colleagues operate from our offices in The Netherlands, Belgium, United Kingdom, Switzerland and the United States. We encourage our employees to share their ideas and to remain at the forefront of innovative services and solutions. We offer the possibility to specialize and develop professionally, taking on personal responsibility for client projects from an early stage. Our culture is informal, transparent and thrives on the open exchange of ideas and knowledge between colleagues. 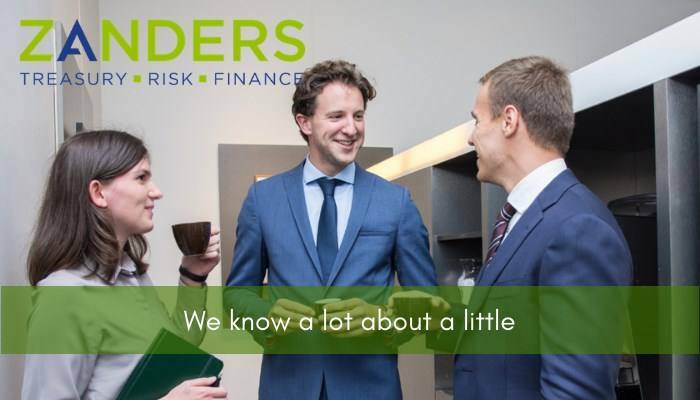 Please send your application for Analyst: Financial Risk Management at Zanders in Bussum including your CV via our website.